Newhouse graduate student Taylor Baucom has been photographing the story of 16-year-old Gena Buza for the past two years. 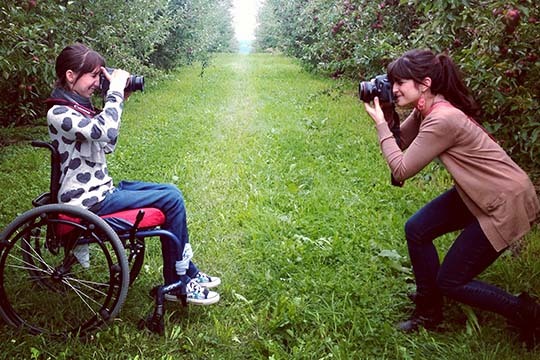 Her photos have captured the daily life and joys of a vibrant teenager, who has a love for art and lives with the day-to-day routines of someone with quadriplegia. Baucom’s subtle, yet powerful, images, which began as part of a Newhouse project, are now gaining a much wider audience on Time magazine’s Lightbox site. Time also ran one of the photos in the June 30 edition of the magazine promoting the online story. 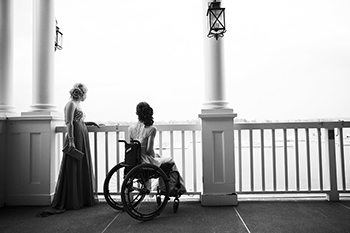 “Raising My Head High”: A 16-Year-Old With Quadriplegia Goes to Her Prom was selected as a photo essay on the site with 29 images from Baucom’s work and a poem by Buza about the day that changed her life and the courage she finds in herself. And that’s exactly what Baucom saw through her camera lens. 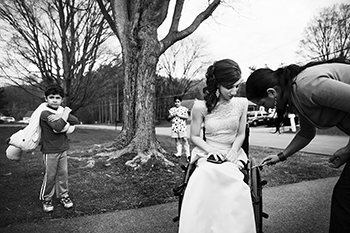 Baucom’s black and white photos on Time’s Lightbox site, which highlights inspired and groundbreaking work, show Buza as she gets ready for her junior prom, prepares for another surgery and enjoys time with her friends and family. “The faith and family dynamic was another important aspect of the story, and Gena’s power stemmed from that,” says Baucom, a graduate student in the Department of Multimedia Photography and Design. The project began as part of the annual multimedia Newhouse Fall Workshop in 2012, which had students searching for subjects for the theme of “a successful high school student.” In the workshop, students spend an intensive weekend working with industry professionals to develop their skills. Baucom spoke with Pastor Dan Williams of the North Central Church in North Syracuse to see if he could recommend any students who were involved in their community or missions work. “He said without hesitation ‘Gena Buza,’” Baucom says. Buza was left paralyzed from the chest down after a car accident in 2003 when she was 6 years old. The photos reveal the details of intimate family life–sharing a laugh over a secret, bedtime rituals and the prom dress reveal—moments Baucom not only photographs but shares in. Her work got the attention of Time by a fellow Newhouse master’s student, Katie Hogin, who was interning at Time and presented Baucom’s photos to editors. Baucom, who won first place in the White House News Photographers Association’s “2014 Eyes of History” student video contest in the sports category, is currently interning with Major League Baseball in New York City. She is also working on her thesis, which is focused on documenting her sister, Jessi, who was born with Down syndrome, and also creating interactive platforms for families with children born with Down syndrome. 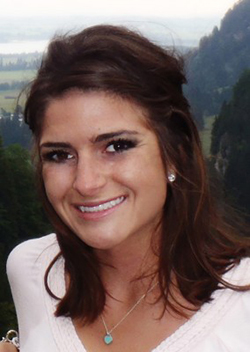 After completing her degree, her future plans may take her anywhere. More of Baucom’s portfolio can be found at http://www.taylorbaucom.com.